The leaders of South and North Korea sent congratulatory messages to Chinese leader Xi Jinping on his re-election as president, Xinhua News Agency reported. 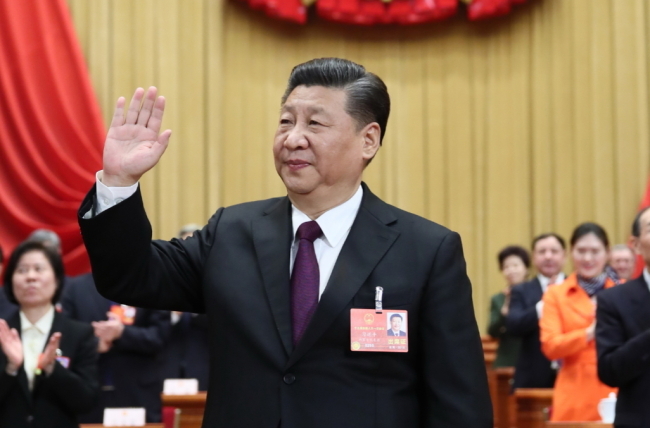 Xi, 64, was unanimously picked president Saturday at the ongoing session of the 13th National People's Congress. He was also elected chairman of the Central Military Commission. President Moon Jae-in said in his message Saturday that he wishes that under Xi's leadership, China realizes the Chinese dream as soon as possible and makes a greater contribution to peace and development in Northeast Asia and the world. "With this year marking the 10th anniversary of the establishment of the South Korea-China strategic cooperative partnership, Moon said he would like to make efforts with Xi to steer bilateral relations toward maturity and into a new era," the Chinese state-run news service said. North Korean leader Kim Jong-un said on the same day he wishes China will make greater achievements in the construction of socialism with Chinese characteristics in the new era.